^ Lanza, J.; Vargo, E. L.; Pulim, S.; Chang, Y. Z. (1993). “Preferences of the fire ants Solenopsis invicta and S. geminata (Hymenoptera: Formicidae) for amino acid and sugar components of extrafloral nectars”. Environmental Entomology 22 (2): 411–417. doi:10.1093/ee/22.2.411. ^ Lanza, J. (1991). “Response of fire ants (Formicidae: Solenopsis invicta and S.gerninata) to artificial nectars with amino acids”. Ecological Entomology 16 (2): 203–210. doi:10.1111/j.1365-2311.1991.tb00210.x. ^ Chen, Li; Sharma, K.R. ; Fadamiro, H.Y. (2009). “Fire ant venom alkaloids act as key attractants for the parasitic phorid fly, Pseudacteon tricuspis (Diptera: Phoridae)”. Naturwissenschaften 96 (12): 1421–1429. Bibcode: 2009NW.....96.1421C. doi:10.1007/s00114-009-0598-6. PMID 19714317. ^ Deyrup, M.; Trager, J. (1986). “Ants of the Archbold Biological Station, Highlands County, Florida (Hymenoptera: Formicidae)”. The Florida Entomologist 69 (1): 206–228. doi:10.2307/3494763. JSTOR 3494763. ^ Nickerson, J.C.; Whitcomb, W.H. ; Bhatkar, A.P. ; Naves, M.A. (1975). “Predation on founding queens of Solenopsis invicta by workers of Conomyrma insana”. The Florida Entomologist 58 (2): 75–82. doi:10.2307/3493384. ^ Nichols, B.J. ; Sites, R.W. (1991). “Ant predators of founder queens of Solenopsis invicta (Hymenoptera: Formicidae) in central Texas”. Environmental Entomology 20 (4): 1024–1029. doi:10.1093/ee/20.4.1024. ^ Jouvenaz, D.P. ; Blum, M.S. ; MacConnell, J.G. (1972). “Antibacterial activity of venom alkaloids from the imported fire ant, Solenopsis invicta Buren”. Antimicrobial Agents and Chemotherapy 2 (4): 291–293. doi:10.1128/AAC.2.4.291. PMC: 444309. PMID 4670503. https://www.ncbi.nlm.nih.gov/pmc/articles/PMC444309/. ^ Chen, L.; Fadamiro, H.Y. (2009). “Re-investigation of venom chemistry of Solenopsis fire ants. II. Identification of novel alkaloids in S. invicta”. Toxicon 53 (5): 479–486. doi:10.1016/j.toxicon.2009.01.016. PMID 19673093. ^ Howell, G.; Butler, J.; Deshazo, R.D. ; Farley, J.M. ; Liu, H.L. ; Nanayakkara, N.P. ; Yates, A.; Yi, G.B. et al. (2005). “Cardiodepressant and neurologic actions of Solenopsis invicta (imported fire ant) venom alkaloids”. Annals of Allergy, Asthma & Immunology 94 (3): 380–386. doi:10.1016/S1081-1206(10)60991-X. PMID 15801250. ^ Baer, H.; Liu, T.-Y. ; Anderson, M.C. ; Blum, M.; Schmid, W.H. ; James, F.J. (1979). “Protein components of fire ant venom (Solenopsis invicta)”. Toxicon 17 (4): 397–405. doi:10.1016/0041-0101(79)90267-8. ^ dos Santos Pinto, J.R.; Fox, E.G. ; Saidemberg, D.M. ; Santos, L.D. ; da Silva Menegasso, A.R. ; Costa-Manso, E.; Machado, E.A. ; Bueno, O.C. et al. (2012). “Proteomic view of the venom from the fire ant Solenopsis invicta Buren”. Journal of Proteome Research 11 (9): 4643–4653. doi:10.1021/pr300451g. PMID 22881118. ^ a b Prahlow, J.A. ; Barnard, J.J. (1998). “Fatal anaphylaxis due to fire ant stings”. The American Journal of Forensic Medicine and Pathology 19 (2): 137–142. doi:10.1097/00000433-199806000-00007. PMID 9662108. ^ a b c deShazo, R.D. ; Williams, D.F. ; Moak, E.S. (1999). “Fire ant attacks on residents in health care facilities: a report of two cases”. Annals of Internal Medicine 131 (6): 424–429. doi:10.7326/0003-4819-131-6-199909210-00005. PMID 10498558. ^ Xu, Y.; Huang, J.; Zhou, A.; Zeng, L. (2012). “Prevalence of Solenopsis invicta (Hymenoptera: Formicidae) venom allergic reactions in mainland China”. The Florida Entomologist 95 (4): 961–965. doi:10.1653/024.095.0421. ^ Haddad Junior, V.; Larsson, C.E. (2015). “Anaphylaxis caused by stings from the Solenopsis invicta, lava-pés ant or red imported fire ant”. Anais Brasileiros de Dermatologia 90 (3): 22–25. doi:10.1590/abd1806-4841.20153420. PMC: 4540499. PMID 26312665. https://www.ncbi.nlm.nih.gov/pmc/articles/PMC4540499/. ^ Candiotti, Keith A.; Lamas, Ana M. (1993). “Adverse neurologic reactions to the sting of the imported fire ant”. International Archives of Allergy and Immunology 102 (4): 417–420. doi:10.1159/000236592. PMID 8241804. ^ Rhoades, R.B. ; Stafford, C.T. ; James, F.K. (1989). “Survey of fatal anaphylactic reactions to imported fire ant stings”. Journal of Allergy and Clinical Immunology 84 (2): 159–162. doi:10.1016/0091-6749(89)90319-9. PMID 2760357. ^ Lockey, R.F. ; Ledford, D.K. (2014). Allergens and Allergen Immunotherapy: Subcutaneous, Sublingual, and Oral, (5th ed.). Boca Raton, Florida: CRC Press, Taylor & Francis Group. pp. 409–410. ISBN 978-1-84214-574-6. ^ Smith, M.R. (1965). House-infesting Ants of the Eastern United States: Their Recognition, Biology, and Economic Importance. Washington, D.C.: United States Department of Agriculture. p. 43. OCLC 6078460. http://antbase.org/ants/publications/10395/10395.pdf. ^ Stiles, J.H. ; Jones, R.H. (1998). 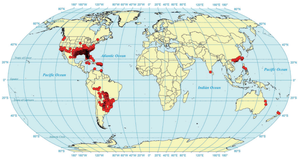 “Distribution of the red imported fire ant, shape Solenopsis invicta, in road and powerline habitats”. Landscape Ecology 13 (6): 335–346. doi:10.1023/A:1008073813734. ^ Vander Meer, R. K. Vander; Slowik, T. J.; Thorvilson, H. G. (2002). "Semiochemicals released by electrically stimulated red imported fire ants, Solenopsis invicta". Journal of Chemical Ecology. 28 (12): 2585–2600. PMID 12564802. doi:10.1023/A:1021448522147. ^ Mackay, W.P. ; Vinson, S.B. ; Irving, J.; Majdi, S.; Messer, C. (1992). "Effect of electrical fields on the red imported fire ant (Hymenoptera: Formicidae)". Environmental Entomology. 21 (4): 866–870. doi:10.1093/ee/21.4.866. ^ Slowik, T.J.; Green, B.L. ; Thorvilson, H.G. (1997). “Detection of magnetism in the red imported fire ant (Solenopsis invicta) using magnetic resonance imaging”. Bioelectromagnetics 18 (5): 396–399. doi:10.1002/(SICI)1521-186X(1997)18:53.3.CO;2-N. PMID 9209721. ^ Anderson, J.B.; Vander Meer, R.K. (1993). “Magnetic orientation in the fire ant, Solenopsis invicta”. Naturwissenschaften 80 (12): 568–570. Bibcode: 1993NW.....80..568A. doi:10.1007/BF01149274. ^ Capinera 2008, p. 189. Capinera, J.L. (2008). Encyclopedia of Entomology (2nd ed.). Dordrecht, Netherlands: Springer. ISBN 978-1-4020-6242-1.